Christian Questions is a Christian talk radio program that aims to provoke meaningful discussion along spiritual lines. We say it is "Talk Radio with a Purpose," and that purpose is to initiate thinking and study based on scriptural evidence as presented in the Bible. We invite listener participation, encouraging a nurturing, politically-free environment of expression on biblical topics. We aim to provide a comprehensive perspective on a wide range of studies and delve into layers of Scripture and meaning that you might never have considered before. 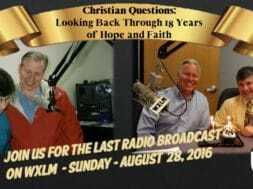 Christian Questions began airing June 12th, 1998 as a result of an idea to produce a Christian radio talk show that was Bible-based, where discussion and opinions would be welcome. All those who work to produce a quality program each week are 100% volunteers, including your hosts,Rick and Jonathan. Matthew 10:8b states, ...freely ye have received, freely give. For this reason, donations are never solicited on air, and any received are used only to continue the broadcast according to the Lord's will. We appreciate and welcome your feedback! Please feel free to suggest an upcoming program, ask a biblical question, share a thought by blog, email or Facebook, and of course, offer any words of encouragement or share uplifting stories. Philippians 4:8: Finally, brethren, whatsoever things are true, whatsoever things are honest, whatsoever things are just, whatsoever things are lovely, whatsoever things are of good report; if there be any virtue, and there be any praise, think on these things. previous What Rights and Privacy Should Children Have?